Military Sealift Command this month recognized the large medium-speed roll-on/roll-off ship USNS Seay, which is operated for MSC by Maersk Line, Limited and is manned in all licensed positions by American Maritime Officers. The following was posted on the MSC Facebook October 11 and is available online. 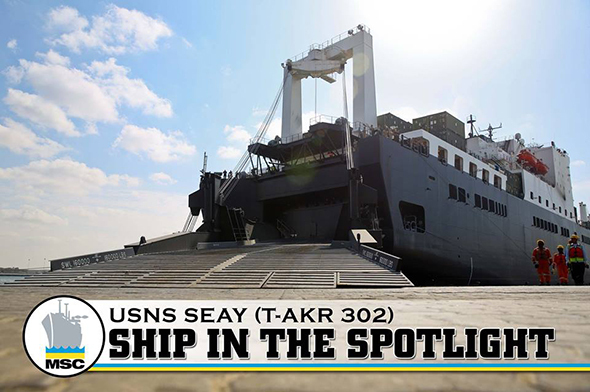 This week help us recognize Military Sealift Command's USNS Seay (T-AKR 302) a maritime prepositioning ship (that) recently conducted dynamic interface testing for the MV-22 Osprey with Naval Air Systems Command off of the East Coast. This testing Seay supported added the MV-22 to her NAVAIR certification profile. This testing will also allow Seay's sister ship USNS Pililaau (T-AKR 304) to also receive the same upgrade to her NAVAIR certification. Certification of the MPF platforms to support the MV-22 Osprey is a Headquarters Marine Corps initiative.